It’s not just big, it’s massive and after a fair few months of waiting, this hard-hitting mobile game has found itself a place on the Nintendo Switch and it feels right at home. By no means would I say the two are a perfect fit for one another, but playing it on Switch does make for a worthwhile experience that can be yours for free, and runs smoothly at around 45 FPS. Now, for those of you who may already have the game on mobile and are thinking of trading up, it is of course, worth it. On top of new global servers so you can play against anyone in the world, improved graphics and having the chance to play an even better version of the game, there is an incentive for playing the mobile game previously. Whether you purchased them or earned them, for every Hero you acquired in the mobile game, provided you’ve linked your mobile account to your “Nintendo Switch Player ID,” you can earn 10,000 Gold coins per hero, as part of a special offer. Also, we can’t forget the fact that the Switch version of the game supports the Pro Controller and the two work great together. As for other improvements the Switch release has over the mobile version, animations have been improved, lighting effects have been touched up, the Heroes (playable and unlockable characters,) have different stats to their mobile counterparts and even butterflies have been added to maps. Not that they were actually needed, but hey, it’s something you can take the time to admire in between chaining kills and taking down towers. Essentially, Arena of Valor is an entirely different beast on Switch and because of those differences, which includes it being made by a different development team, there is one big issue, no cross-play support. So, if you were hoping you could go against your mobile friends, you can’t. If you’ve to get into Arena of Valor however, there is no better time than now. And since you will certainly require to know more about it, let’s get you covered, shall we? For the most part, it is a like Paladins, another free to play title in which will mostly see players band together in teams and wage war. Something that I feel is a huge redeeming factor however, is not just the fact it is easy to pick up, but you can learn at your own pace, thanks to available tutorials and an in-game practise mode. There are even videos available, to help better inform you about everything you could need to know. For a quick course in combat right now though, the left analog stick is used for movement, A is used for attacking, with the likes of L, R, ZL, ZR, B being used for abilities that can either deal damage to your enemies, as way of a special attack, help you recover life, or just have you run faster in a bid to flee. Not all of your abilities will be available to you from the outset of each match, as they are unlocked by playing and levelling up. You will actually be prompted when you can unlock them and/or strengthen those you have already, which requires you to hold X and then press the associated button to the button you wish to enhance. Although this might sound a little iffy, especially when it plays out the way it does, whilst you’re engaging in real-time 5v5 battles, the upgrading is something that takes mere seconds to do and doesn’t interrupt combat all that much. But, for those of you who don’t need to be in control of how their character levels up, you can always enable auto-upgrade and have the game do it for you. Another thing you can auto, is auto spending. During battles, players can earn gold and lots of it, for defeating monsters and enemies, only this gold, is just for that match. Although there is another kind of gold that you can earn and use to buy new Heroes, which comes in marginal amounts, the match gold is just for battles and can be used to buy items to empower your Hero. By using the auto function, items will be purchased for you, provided you have the required amount gold to buy them. If you wish to be in control of what you buy however, you just need to disable the auto-purchase function. As for how battles are won and/or played out, there are some differences, but for the most basic form of online play, which is a 5v5 match, battles take place on a square-shaped map. Both teams have a base, where an altar is present that they can return to, to restore HP and Mana and a core. If the core falls, its game over and the team wins. To help defend the core, there are three lanes, in which towers are erected. Both sides have three towers in each and you will need to destroy at least one line of them, in your bid to assault the enemy’s base. Only, it’s not as simple as that. While you need to take down your enemy team’s tower, you also need to defend your own. Admittedly though, the towers are capable of doing some damage themselves as they will attack anyone in range of them and especially those who are attacking an opposing Hero. To assist with tower destruction, both sides have Minions, whom upon spawning, will roam the battlefield, attacking Heroes in their warpath and take on the towers. It is when they are drawing fire that you use them as a shield and attempt to assault the towers yourself. If for any reason you are failing to get ahead, as the opposing force is too superior, both sides start with their characters on Level 1 and end on Level 15. The only thing that they might be doing differently, is they’re talking down the monsters on the field, which when defeated, grant buffs such as Might. They also might be working together as a hunting party, or getting to safety and holding down the down button on the D-pad to be recalled back to the altar so they can recover, or just recovering health on the go. In the event the 5v5 Grand Battles aren’t to your liking, due to being too easy, you can always play the 5v5 Abyssal Clash battles. It’s the same principles as the other mode, except there’s one lane instead of three. There’s also a 3v3 Valley Skirmish mode, and a 1v1 Solo Battle mode. There is also the option for custom matches, where rules can be altered, there’s an arcade mode that allows players to play the Hook Wars mode and Ranked Battles. Both Ranked and Hook Wars offer a more intense way of playing and will really test your skills at killing and destroying towers, but they can both be a lot of fun and give you the further practice you need to become a ruthless machine of carnage that can get upwards of 30 kills a match. By the way, although you can die, as there are no lives, there is a timer that needs to count down to 0 before you can come back from the grave and it takes longer the longer the match goes on. Still, there is more to Arena of Valor than what goes on during the battles, there’s the out of battle stuff as well. From preparing for your next battle or just heading over to the shop to spend your accumulated gold, new Heroes can be brought, as can skins and Arcana, attachable objects that can improve things such as damage, attack speed and more. There are also rewards for regular logging in, achievements that give rewards when you met their goals and even daily missions. The biggest drawback to Arena of Valor though, is even though you can earn gold, gems and everything else, it is at a snail pace and you will need to put in a lot of time to truly start benefiting, whereas opening your wallet will help you cut down on a lot of the grinding. So, if you were hoping you could just come in and get all the best characters straight away, you will be sorely mistaken. Unless you put your money where your mouth is, it can take a long time before you can remotely pay for one of the best characters. But if you do opt for the free ride all the way, because it is a grind, when you do reach that point that you can buy someone else, remember each Hero does have a class (Tank, Warrior, Assassin, Mage, Marksman and Support,) so as tempting as it is to just buy a cheap character, unless you’re going to play as them, you’re just wasting your hard earned gold. Should that not bother you though, the good news is Arena of Valor could very well be your next Switch game you 100 or more hours into. 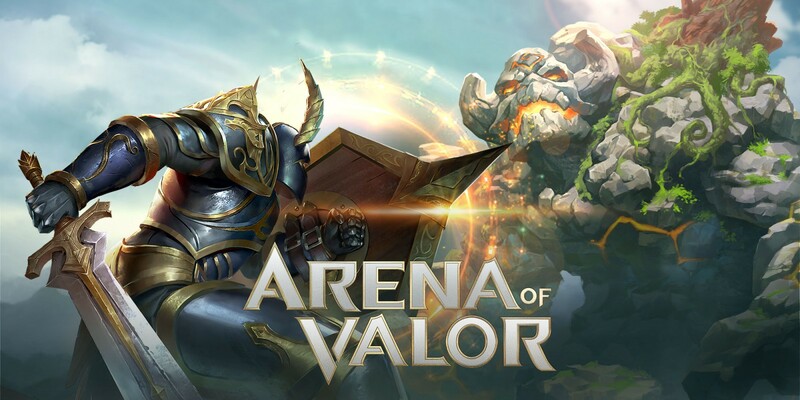 Just because Arena of Valor does not have graphics on a similar level to Fortnite, or even Paladins, due to its top down perspective, that doesn’t mean it is not yet another free to download and totally addictive game that you can play for hours on end. Aside from the occasional crash, the game performs well, I was never unable to find a match and there is nothing quite like getting that one game where Death is on your side and you’re the character in the match, whom flat out can not die. By no means is this a game I’d dedicate the rest of my life too, but it is a game every Switch owner should download at least once, just to give a try and decide if it’s for them.